Pownall is an acknowledged master of the monologue and this collection brings together four wonderful plays written to be performed by a single actor. 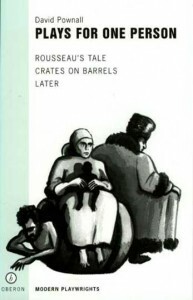 Crates on Barrels was the play with which Paines Plough Theatre Company began life and they also produced Later. Rousseau’s Tale has played at the Gate, the Cockpit and the Cottesloe and was originally directed by.